Rewind five years and I wouldn’t have been seen dead in a kilt, sister’s wedding or not. As it stands, I am one quarter Irish and one quarter Italian, with only the final half being of actual Scottish stock; and even then, I’m a saft southern jessie city-boy that’s only left the central belt for the very occasional day trip or holiday. If wannabe Americans have no claim on the ability to wear a kilt, then I’d have said I have little more. And that’s not going into any of the it’s-a-skirt arguments. Alas, as an usher (it’s great directing people when you have no idea what’s going on yourself), I was almost a part of the bridal party and thus had to match everybody else that was important… All the men were decked out in a tartan called “Spirit of Bannockburn” chosen not for its historical significance (I think our bloodline is all up in the Murray and the Cameron, if anything) but for its colour scheme matching everything else — purple. So it took a wee while to get dressed. While I somewhat warmed to the fact of the kilt itself, all the finery that went with it rubbed me the wrong way (and the shirt’s collar was a bit too tight, so any longer in it and I would have had a big red smear of raw skin around my neck), so a little after all the official proceedings were complete I decided to change into a marauding football fan by swapping the entire top half for a white t-shirt (long-sleeved, naturally). But now it’s the moment you’ve all skipped over the rest of the entry for… The photographic evidence. RDZ dressed as a marauding football fan. Sheesh, I have a long torso. I’m a little teapot, short and stout… If you look closely, you can almost see me acting as if I’m enjoying myself. I trimmed my beard especially for this. On a related note, congratulations Eilidh and Dave. GL & HF. 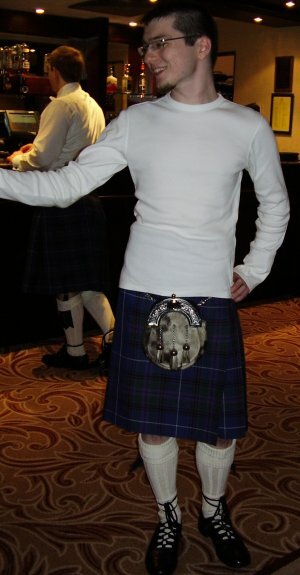 This entry was posted in Nondescript and tagged formal, kilt, RDZ, wedding by Rao Dao Zao. Bookmark the permalink. I love the editing on the first picture. Because you’ve removed either side and my jacket is the same colour as the background you appear to have a hand on your shoulder from absolutely nowhere.